I have recently been in touch with a former school friend Vivienne Salmon (nèe Bragg). 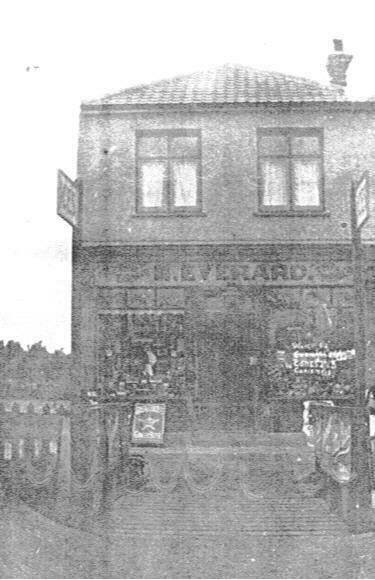 Her Uncle Horace Everard ran a shop back in the 20s with his wife Mary, on the west side of Laindon High Road, almost opposite St Nicholas Lane. I traced the couple on the 1929 Electoral Register where they are recorded living in ‘Station Road’ (later known as High Road), Laindon. 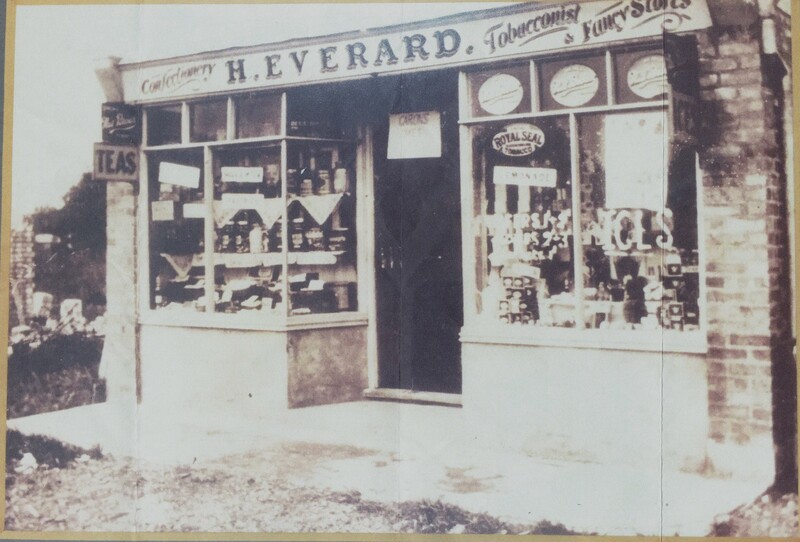 Horace had a niece called Hilda Lois Everard, a single lady who passed away recently. Some years ago, Hilda has written a story about her childhood holidays in Laindon which she spent with her Granny, Elizabeth Lerpiniere. 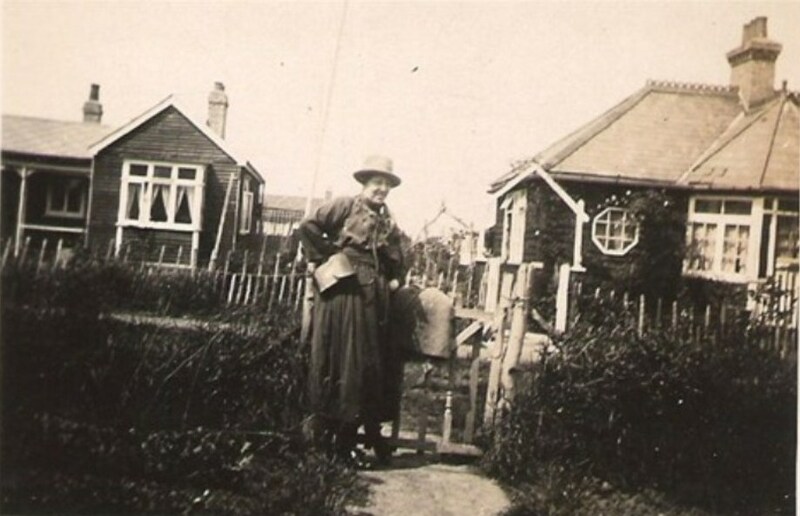 I traced ‘Granny’ on the 1929 Electoral Register where she is recorded living in Worthing Road, although sadly the name of her cottage isn’t mentioned. Horace spent his last years living with his married daughter, Gladys Baker in “Eastwood” Queen’s Road, Laindon, also home of Vivienne’s cousin Mary Baker, another school friend of ours. Horace passed away in 1960. Vivienne has kindly provided Hilda’s story to be added to the Laindon Archive and I copy it below. Whenever the scent of the Albertine rose comes wafting through the air, I am immediately transported back to childhood days when, with my family, I spent the summer holidays with my grandparents in rural Essex. Our means were too slender to allow of a boarding-house holiday by the sea but each summer, schooldays over for the time being, we children eagerly looked forward to our annual retreat. Granny’s cottage was too small to accommodate all of us but on the large plot of land attached to it was an old horse-bus, sheltered by tall, rustling poplars and this served as our pied-a-terre. Here my mother, sister and I slept on prickly straw-filled mattresses whilst Dad and the boys made do with a tent pitched amongst a variety of fruit trees. My father, a casual dockworker, stayed at home during the week, tramping to the docks every day in the hope of being taken on for a day’s work and then joined us at the week-ends. With mother, we children would wait eagerly for him at the end of the lane, mother anxiously waiting to hear if he had been lucky enough to get at least one or two day’s work that week. Dad was always cheerful, but alas, his ship seldom came home! Although we always referred to it as ‘Granny’s Cottage’, it had been built by my Grandfather for their retirement on land acquired cheaply. He had been a master carpenter, inheriting the business from his father who, I understood to have worked on the GREAT EASTERN. This information was always imparted with a sense of pride and as a very small child I assumed this to be something quite magical without knowing really what it was! I well remember the old workshop with the stone grinding wheel outside, which always intrigued us. One would turn the handle whilst another moistened the wheel with an old paintbrush as Grandad pretended to sharpen yet another tool. He was a very short, barrel-chested man with a leonine head and a great square jaw with rock-like teeth. I believe one of the London teaching hospitals had been interested in having his head for anatomical study after he had no further use for it himself, but I am glad to say it was in due course buried still attached to the rest of him when he finally died in his sleep in his late seventies. My grandparents had spent most of their married lives on the Isle of Dogs but grandmother was from Dorset and always retained a little of her local accent. A real countrywoman at heart she would love to take my brothers up to the woods to look for ‘woild woilets’ or firewood and many another thing to fire their imagination. Everything she planted grew in abundance; even twigs used as pea sticks sprouted profusely. Many a small bird she succoured, her work-worn and blue veined hands very gently feeding them with morsels of food. Doubtless it must have rained sometimes but all I can remember is sun-drenched, carefree days when we explored the nearby woods and fields and generally indulged in the pleasures of childhood. Every wood was an ‘enchanted forest’; every stream a ‘dare’. Although a rather delicate child I had always a love of the country and the great outdoors. In imagination I ranged from being a cowboy to a modern Robin Hood. My family could not supply me with a pony but my brothers did their best and made me a bow and arrows from withies and having persuaded someone to run ahead with a turf tied to a piece of string, I would set forth to stalk my quarry. This caused much hilarity and little damage beyond a few grazed knees when my aim went a bit awry. Another treat was to bury large potatoes in the heart of the bonfire and although we seldom had the patience to wait until they were well cooked we ate the half-raw, smoky jacket potatoes with great relish. My sister and I, the youngest of the bunch, would spend hours amongst the great swathes of hay, making nest-like ‘homes’ and mother would come out bearing plates of fried eggs and mash which, eaten outdoors, seemed more delectable then than I am sure smoked salmon would today. By the time we had to return to our little terrace house, the fruit trees were heavy with their bounty and off we went laden with plums, pears and blackberries, all to be preserved or made into jam to help see us through the winter. We were poor with few of today’s comforts and luxuries but mother was a wonderful manager, dad a cheerful optimist and we children were very happy within a loving, well-knit family. On the last night of the holiday as I lay on my straw mattress in the old horse-bus, listening to the whispering of the tall poplars that fringed the plot, I would look forward to next summer when once again we would descend on Granny’s cottage. Again to be greeted by old Floss, the grizzled black retriever waving her plume of a tail and the perfume of the Albertine roses drifting on the breeze. Mary Everard - thought to be on the path of their bungalow. 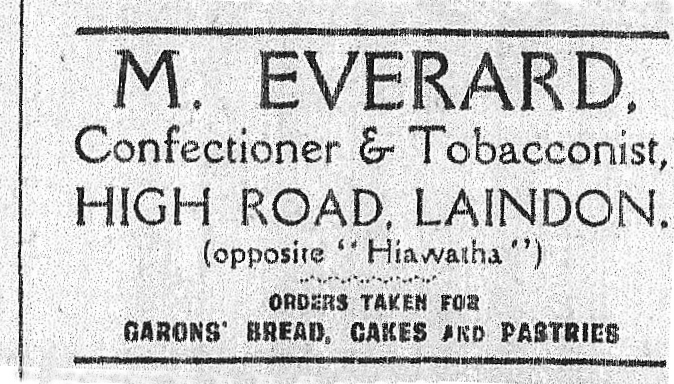 Advertisement in the 1928 Laindon Advertiser. Dear Hilda, Thank you for your beautiful article. It sums up the simple pleasures of a bygone age. Although I am sure that given the opportunity, children would still enjoy this type of holiday. I was interested to read about Gladys Baker and her daughter Mary Baker who was in my class at Laindon High Road School. In those days Mary’s best schoolfriend was Josie Beasley (known to her friends as beeswax). These two were always laughing and joking and it is fascinating now to recall how all the girls in my class were grouped together in pairs. For instance Vanessa Crew and Christine Thompson and another pair, Cherry Walden and Lesley Cousins. These girls were always chirping away much to the annoyance of Mr Rees. Mary Baker was and probably still is a very good looking girl, annoyingly she left sometime early in the fourth year to go to a commercial college. The bungalow mentioned here by Nina, ‘Eastwood’ in Queens Road was very nice indeed, a smart and cosy residence. I went there after school one sunny September evening in 1961 to play records with a whole group from our class, shortly before Mary left LHR for good. I always wonder what happened to her, she always seemed so grown up and pretty compared with the rest of the girls of 4X as it was known. Happy times, never to return.